The USD 5 billion Avaza resort on the Caspian Sea, featuring high-rises, 5-star hotels, and an artificial island, faces a host of problems that could dim its tourism potential. Sometimes, a lifetime can be too short for a ruler's ambitions. Turkmenistan's first president, the megalomaniac Saparmurat Niyazov, fulfilled his dream of turning Ashgabat, once a dusty town on the southernmost rib of the Soviet Union, into a fairy-tale landscape strewn with white marble facades to show his power. The stunning architecture of the capital city, Niyazov thought, should serve to herald the energy-rich country's rising economic prosperity. Deeply impressed by the Turkish model of mass tourism while on a visit to Antalya a few years ago, Niyazov began plans to apply it to his own country's seashore. The first six hotels opened in June. The entire Avaza complex is to materialize in three stages to be completed by 2020 at an estimated cost exceeding USD 5 billion. 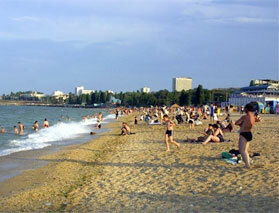 The resort area will cover an area of 50 square kilometers and stretch along 16 kilometers of beachfront. The complex will feature 60 high-rise hotels, villas, an artificial island and an 8-kilometer manmade river, an amusement park, sports facilities, a large business center, a sports stadium, a health center, a shopping mall, and a new airport to cope with the anticipated stream of visitors – in brief, a huge touristic paradise unmatched in the region. More than a dozen international contractors from Russia, France, Turkey, Iran, and other countries are participating. The artificial island at the heart of the development will be linked to the shore by an isthmus and is to cost more than USD 1 billion. It will host a huge conference center and a hotel for visiting high-level state guests. «Seen from above, the artificial island has the shape of a crab, the Turkmen president's zodiac sign. Looking from the seaside, the blocks of high rise buildings appear to the eye like the canvas of a sailing ship blown by the wind, symbolizing Turkmenistan's steady advance,» said Muhammet Cap, executive director of Turkey's Sehil construction company, the lead developer on the island project, in a presentation to the press in Istanbul earlier this year. «If we look back on world history, we can see that most important agreements were signed either at sea or at a seaside resort. The reason could be the selection of a neutral ground, maximal security, and the symbolic importance of the place. That is what we had in mind when we made the plans for the island,» Cap said. Official statements and media reports assign Avaza, poised to become the «Dubai of Central Asia,» world-class significance and stress its uniqueness and accordance with international standards. However, challenges abound. In October, as a second round of hotel openings was marked with a celebration led by the president, onlookers were impressed by the new buildings even as some wondered how the growing rows of hotels can ever be filled with visitors in a country that rivals North Korea in its isolation and authoritarianism. «Facing difficulty in filling the hotels, the ministries in Ashgabat received orders to select staff to be sent to spend a few nights in the five-star hotels. Some had to pay the hotel bills from their own pocket,» said Farid Tuhbatullin, the head of the Vienna-based Turkmen Initiative for Human Rights. With the global economic crisis making itself felt in almost all spheres, it is hard to imagine a tourist boom along the Caspian Sea in the short term. «The economic crisis has definitely affected the travel industry. People look mostly for cheap offers and they cut back. Instead of traveling a few times a year, they don't go as often,» said Tanya Evans, director of Silk Road and Beyond, a tourist agency based in London. Evans said hotels are having difficulty selling rooms even at touristic destinations such as Dubai. Location is also important. «Dubai's advantage is the warm weather during the winter. People from the West and the CIS go there in December, while in Turkmenistan the weather is more like in Europe. The summer season is short. Avaza is not a good location for tourism. Turkmenistan will only appeal to cultural tourists who want to combine two or three interesting sites,» she said. Unlike Dubai, Avaza has no potential for stop-over visitors on long-distance flights. International direct flights to Turkmenbashi do not exist. Few international airlines serve Ashgabat, 600 kilometers away, and air tickets are expensive. Dubai may have been hit by a homegrown credit crisis in recent days, but on the Caspian development plans for the Avaza tourist zone remain intact in Turkmenistan's draft budget for fiscal year 2010 in spite of the economic downturn. Urban development and construction of new housing projects will also maintain their current pace. «Perhaps the visa rules can be relaxed but at present it's very difficult to obtain the Turkmen visa,» Evans said. In contrast to other tourist destinations such as Turkey, where visas are issued upon arrival in-country, foreign visitors to Turkmenistan have first to obtain an official or private invitation to apply for a visa before going on tour. The visa requirement also applies to citizens of other former Soviet countries. The government hopes that tourism will help diversify the economy and ease the country's heavy dependence on the extraction of oil and natural gas. «There is no transparency in Turkmenistan's budget figures,» said Annette Bohr, a Central Asia specialist with the Chatham House think tank in London. Outsiders don't really know if the budget is running a surplus or a deficit because the revenue from gas exports has fallen sharply. «It is a great mystery – how can they throw these amounts around?» Bohr said. In the initial stage, Turkmenistan announced that Avaza would be financed from the state budget, but shortly afterward the government formed a special business zone to stimulate investment in the project, with promises to foreign investors of simplified visa rules, tax breaks, customs privileges, insurance, and other benefits. So far, state funds have paid for every completed building at Avaza. The country has a record of arbitrary expropriations of foreign investment without compensation. «The lack of established rule of law, inconsistent regulatory practices, and unfamiliarity with international business norms are major disincentives to foreign investment,» a 2008 report by the U.S. Embassy in Ashgabat stated. «Actually, what Berdymukhammedov is trying to make clear is that he is able to build five-star hotels, that he can afford it,» Tuhbatullin said.